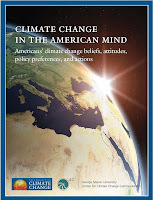 Maria Energia: Americans Support Action on Climate Change - Question is, How? Americans Support Action on Climate Change - Question is, How? Yale and George Mason Universities released survey results last week that showed more than 90 percent of Americans believe "the United States should act to reduce global warming." The survey of 2,164 Americans was conducted last fall, at the start of the economic downturn - and some of this support has likely eroded with the worsening crisis. But it should be noted that respondents believed national action was needed, in part, to free the U.S. from its dependence on foreign oil. This message of national security and other messages of economic stability and job creation - as well as straightforward talk of costs - will be critical to moving climate change solutions forward. i think the new energy act that the Obama administration is trying to sell right now is going to be great for the renewable market in the next couple of years. It is also great news for that 90% of people who want some significant energy policy change. The American way of polluting the earth should be stopped, and I'm glad the global warming served as a starter for this, even though the climate change has nothing to do with the CO2 levels or pollution. But at least people are scared of something that they can see with their own eyes. The people want action climate change, clean energy, energy independence - whatever you want to call it - and now we have an administration ready to take action!